need to be considered in Iraq. LALLO, Naseem Yousif; SELAMAT, Mohamd Hisyam. 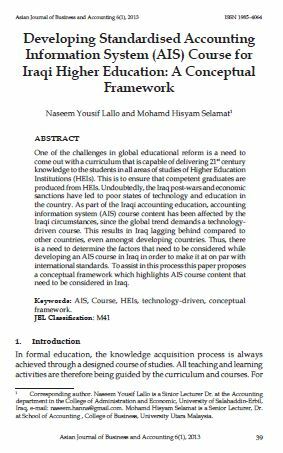 Developing Standardised Accounting Information System (AIS) Course for Iraqi Higher Education: A Conceptual Framework. AJBA, [S.l. ], v. 6, n. 1, june 2013. ISSN 2180-3137. Available at: <https://ajba.um.edu.my/article/view/2667>. Date accessed: 25 apr. 2019.